Goods and Services Tax Network (GSTN) is a Section 8 (under new Companies Act, not for profit companies are governed under section 8), non-Government, private limited company. It was incorporated on March 28, 2013. The Company has been set up primarily to provide IT infrastructure and services to the Central and State Governments, tax payers and other stakeholders for implementation of the Goods and Services Tax (GST). The GSTN owns and operates the hardware and software of the Goods and Services Tax network. GSTN manages the entire IT system of the GST portal and the underlaying databases. This portal is used by the government to track each and every transaction in goods as well as services in India and provides the taxpayers with a robust system to meet all the service related need under GST. All the returns are to be filed on this web portal. The Authorised Capital of the company is Rs. 10,00,00,000 (Rupees ten crore only). The Government of India holds 24.5% equity in GSTN and all States of the Indian Union, including NCT of Delhi and Puducherry, and the Empowered Committee of State Finance Ministers (EC), together hold another 24.5%. Balance 51% equity is with non-Government financial institutions. Share Holding : Central Government (24.5%); State Governments & EC (24.5%); HDFC (10%); HDFC Bank (10%); ICICI Bank (10%); NSE Strategic Investment Co (10%); and LIC Housing Finance Ltd (11%). The GSTN is chaired by Mr. Navin Kumar, an IAS Officer (1975 batch). The contract for developing this vast technological backend was awarded to Infosys in September 2015. The GSTN is a complex IT initiative. It establishes a uniform interface for the taxpayer and also create a common and shared IT infrastructure between the Centre and States. The GSTN is a trusted National Information Utility (NIU) providing reliable, efficient and robust IT backbone for the smooth functioning of GST in India. It handles complex transactions. The adjustment of IGST (for inter-state trade) at the government level (Centre and States) is extremely complex, considering the sheer volume of transactions all over India. A rapid settlement mechanism amongst the States and the Centre is possible only as there is a strong IT infrastructure and service backbone which captures, processes and exchanges information. The government has strategic control over the GSTN, as it is necessary to keep the information of all taxpayers confidential and secure. The Central Government has the control over the composition of the Board, mechanisms of Special Resolution and Shareholders Agreement, and agreements between the GSTN and other state governments. Also, the shareholding pattern is such that the Government shareholding at 49% is far more than that of any single private institution. The user charges are paid entirely by the Central Government and the State Governments in equal proportion (i.e. 50:50) on behalf of all users. The state share is then apportioned to individual states, in proportion to the number of taxpayers in the state. Operating expenses such as salary, rent, office expenses, internal IT facilities, etc are borne by the Central and State governments. GSTN is the backbone of the Common Portal which is the interface between the taxpayers and the government. The entire process of GST from registration to the filing of returns is done online. It has to support about 3 billion invoices per month and the subsequent return filing for 90 to 95 lakh taxpayers. The GSTN handles various returns, Registrations, Payments and Refunds. 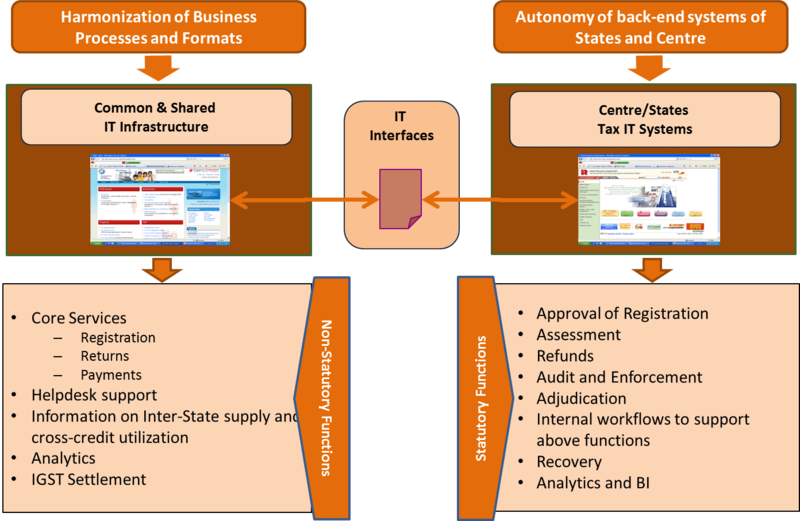 Creation of common and shared IT infrastructure for functions facing taxpayers has been assigned to GSTN and these are filing of registration application, filing of return, creation of challan for tax payment, settlement of IGST payment (like a clearing house), generation of business intelligence and analytics. All statutory functions to be performed by tax officials under GST like approval of registration, assessment, audit, appeal, enforcement etc. will remain with the respective tax departments. The diagram below shows the work distribution.